Editor's note: Our guest blogger this week is Alberto Herrasti, Consulting Director of Digital Government Projects at the Secretaría de la Función Pública (Secretary of Public Administration, SFP) from the government in Mexico. See what other organizations that have gone Google have to say and discover our interactive demos. As the Consulting Director of Digital Government Projects of SFP, I work to bring tools that make information easily accessible to Mexican citizens. We recently deployed Google Earth and Google Maps to solve a long-standing problem. In the past, both our local population and our government workers had trouble finding official documents and records about government agencies and services because this information was distributed across various websites in a fragmented way. Finding something as simple as the opening hours of a state-owned gas station, or the location and address of a nearby hospital would require a search across many official sites. The only alternative would be to physically visit the offices likely to have the information and spend more time waiting in long queues. In 2010, the President’s office directed us to address this problem, and we set out to create a consolidated website (now known as mapas.gob.mx) that would serve as a central repository of geo-indexed data, allowing citizens to easily retrieve up-to-date information overlaid on the map data of Mexico. 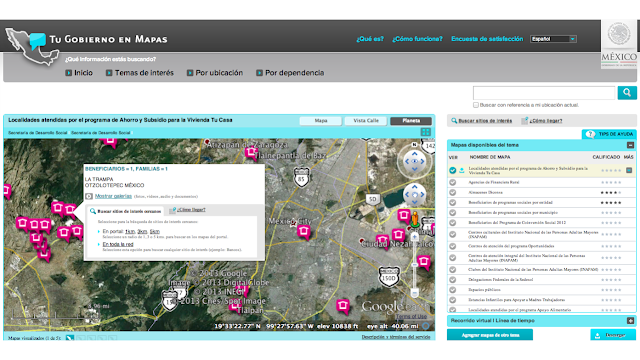 We reached out to a number of mapping technology providers to evaluate their offerings but the Instituto Nacional de Estadística y Geografía (INEGI) -- Mexico's offical mapping and statistics institution -- identified Google Earth and Google Maps as our best option. We completed and launched the new site by 2012. The site integrates data from more than 70 public organizations and aims to place useful and helpful information in the hands of our local population. Now, with the new Google Maps-integrated site, any user can find information by viewing it on a familiar, easy-to-navigate “globe”. We’ve also added a lot of useful information. 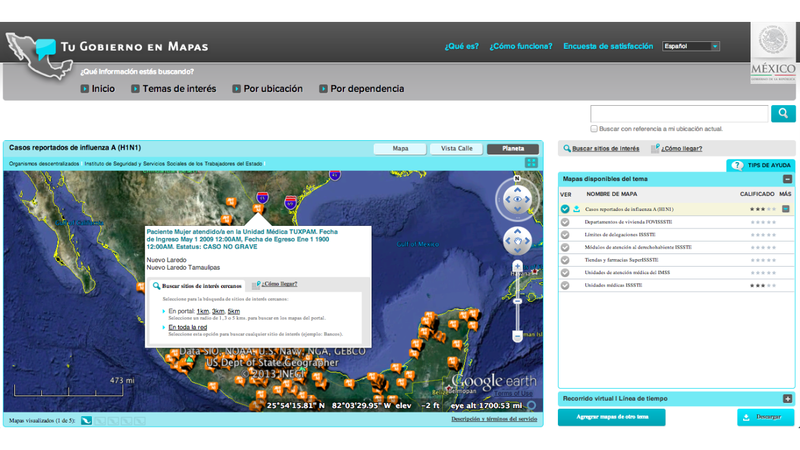 The site now consolidates more than 900 maps with government-related information and covers every region of Mexico. As of 2013, more than 300 people use the site daily, and both awareness and use continues to grow rapidly. Instead of waiting in long lines or spending hours searching online, citizens can simply point their browsers to the new site and use maps to quickly find nearby resources and information. Since we launched the tool in 2012, we’ve had more than 16,150 downloads of the geolocalized data and this tool allows government agencies to respond more effectively and efficiently. Thanks to the Google Earth and Google Maps technology which made the tool easy to build and easy to use, we’re able to better serve our citizens and respond to their needs with the right information at the right time.